Listen to Chapter 1 of this book! Amateur sleuth Annie Tillery has been warned to stay away from Nevshehir, Turkey, where she is heading to meet her boyfriend, Ty Egan, and Cedric Zeeks, Ty's best friend. Intent on helping the two excavate an archeological site where they hope to link human remains to the first African ancestors, Annie does her best to shakes her foreboding feelings as her plane lands in Istanbul and she prepares to embark on her next adventure. But when a stranger claims he is there to pick her up and then disappears once he sees Ty, Annie is immediately thrown back into worry mode-especially after Ty tells her there is unexplained tension surrounding the dig and she receives a threatening note at the hotel. Still, as the three head to Nevshehir, Annie is buoyed by the excitement surrounding ancient Turkey and the possibility of uncovering secrets. The dig is plagued by accidents and theft, however, and the three friends, assisted by the head archeologist's twins, must search the ancient city of Istanbul and the caves of fantastic Cappadocia to find who is sabotaging their work. 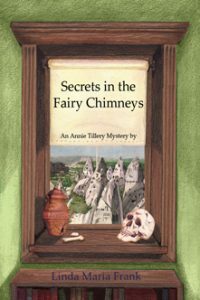 In this young adult thriller, detective Annie Tillery must once again walk on a dangerous path in an attempt to unravel a complicated mystery and solve the secrets in the fairy chimneys. The writing in Secrets in the Fairy Chimneys can be really breath-taking at times so much that I found myself backtracking to reread passages and take it all in again. Lots of depth in description of character and place to bring the exotic into your home and you take in the words. Apart from the CSI angle which, as you would expect from a forensic scientist, is acutely poignant, the rest must have been thoroughly researched as well as nothing about events seems out of place. A captivating and charming plot and a very enjoyable YA book overall. Looking forward to reading more by Linda Frank. 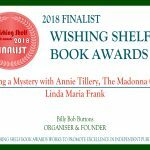 Annie Tillery Mysterys book three ‘Secrets In The Fairy Chimneys’ can be summed up as Indiana Jones meets Nancy Drew with the skills and precision of CSI. A mystery unfolds amidst a mix of ancient history and modern innovation, in an ageless Eastern country where time moves at a camel’s pace. 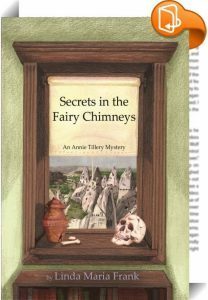 In the third installment in the Annie Tillery Mystery series, Secrets in the Fairy Chimneys, Annie arrives in Turkey to participate in an archeological dig. Annie expects to get picked up by her boyfriend Ty, but when a mysterious driver comes to pick her up and she receives a death threat, she realizes she’s found herself smack in the middle of another adventure. Annie escapes a dire situation right on her first day in Turkey, and then she meets Cedric Zeeks, Ty’s best friend. The dig was discovered a few decades ago, and several thefts have happened on the site. If the thievery isn’t stopped, the government will shut down the dig. Of course Annie and her friends can’t let them happen, so she joins Ty and Cedric at the dig to find out what’s going on. I liked the whole archeological/historical angle. I’m a huge history buff and reading about this ancient city and archeological dig was very entertaining and engaging.The mystery part was suspenseful and I enjoyed trying to find out who the bad guy was. An entertaining book, and I look forward to more books in this series. I received a free copy of this book in exchange for an honest review. Bravo to Linda Maria Frank! This third book in her Annie Tillery Mystery series is a stunner! Although written for a YA audience, even I as a senior citizen was captured by the mystery and intrigue interwoven throughout this story. And who could resist the element of romance embedded in the two oh-so-appealing main characters, Annie and Ty? But most compelling to me was an introduction to the history and topography of this country with its ancient Fairy Chimneys. Half way through this book, I began researching trips to this wonderland and have placed Turkey at the top of my bucket list for future travels. A beautifully crafted, impeccably edited work. Linda Maria Frank deserves many kudos and an equal number of followers. I know I will be looking out for more of her books to recommend to the young adults in my life, but not before I sneak a peak at them myself. Linda Maria Frank's latest Annie Tillery YA novel is her most exotic and ambitious yet. Set in the far-flung environs of Turkey, the book makes imaginative use of the region's caves, conical desert limestone formations, and crowded bazaars--and even bits of the local language. I was struck by the word "effendi" but easily able to decipher its meaning by the context. A few days later I ran across it in the New Yorker magazine, which convinced me it's a word Americans are beginning to know. While the story is an adventure, the setting becomes so familiar that the reader feels like a traveler who has settled into a strange place and become almost comfortable there. I say "almost" because the crimes and dangers produce enough anxiety to keep the reader on tenterhooks, hopeful for the perpetrator's exposure and a peaceful outcome. Annie herself is in danger at several points, and she is also a large part of the solutions. Aside from her, there are nearly a dozen major characters and half a dozen minor ones. One gets used to them and remembers, but had they been listed at the front of the book I would have consulted it a few times. Bottom line: This is a book that takes you away from yourself and lets you live along with Annie in an unusual place, among unusual people, for an exciting and enjoyable while.